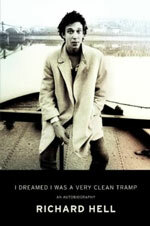 In the NY Observer, Nate Freeman interviews the author of I Dreamed I Was a Very Clean Tramp, the new memoir by Richard Hell. (Yes, as in Richard Hell and the Voidoids.) From the quoted passages Hell sounds like a smell-aware writer.